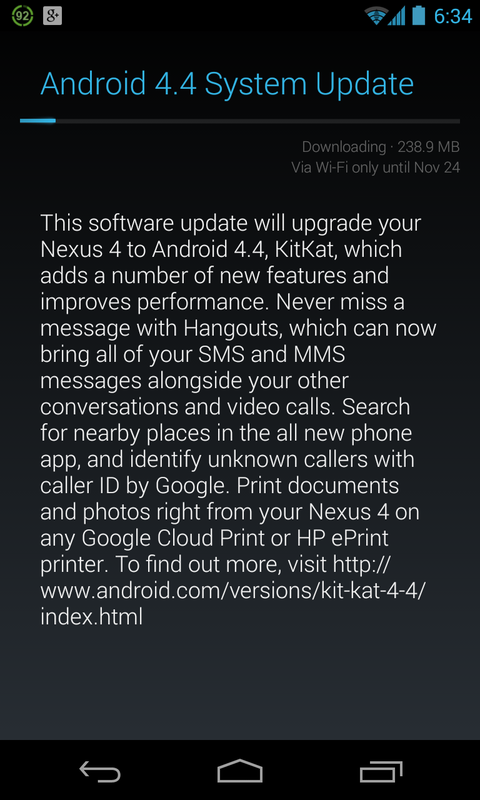 A few days ago, on November 19, 2013, I read that people were beginning to get KitKat updates. Those were the lucky people who got a taste of this OS update first. I wasn't one of them. However, today November 23, 2013, I happened to get this update on my phone. About My PhoneA friend from the US brought me this phone back to Nepal. We do not get this phone here, and I was out of the lucky few to be using this phone in Nepal. I started using this phone from March 31, 2013. I have never flashed the phone with any other custom roms or unlocked it or done anything out of the ordinary with it. I only updated it via the official OTA updates. I have set up encrypting the disk option in the phone and it requires me to enter the security key every time I boot the phone. The same key is used for unlocking the phone. Just yesterday, I was reading through some articles where it was clarified how the updates were selectively sent to Android phones. This explanation came directly from a Google Engineer's comment at reddit. It basically says how randomly phones are selected and updates are sent to the masses. Tapping on the "Check for updates" button repeatedly does not increase the change of getting the update. Someone even joked that it just updates the time of update to the latest date. However, this does not stop it from tapping that button, does it? What I did was go to the place where we check for system updates. My phone had already checked for the last update automatically on 12 something pm. It was around 6 pm already and I thought on clicking the button once again. To my surprise, my phone did find an update for the Android OS and the downloading commenced. This is the screenshot I took before updating my phone. I extracted it from Dropbox which auto uploads pictures from my phone. After waiting for a while for the update file to be downloaded, finally the update procedure was started. The phone restarted and the update procedure actually took place. I guess new files were copied and things were moved around, in the update procedure. Messages such as "Configuring system updates" was displayed with some animated graphics all along. Then the process of optimizing my Android apps began. Around 190 apps were optimized and I don't know what happened but I bet that they were prepared for this new Android version that everyone has been talking about. In the final stages of the update, the screen said "Finishing Boot" and the same screen was displayed for too long. I just waited and waited for around 20 minutes. I decided to man up and click on the power button, had to press it for around 10 seconds and the phone restarted. Those four animated circles came up on my screen and then they danced around. I could here one pop of the Facebook notification in the background and the phone vibrated once. The same animated four circle screen has been stuck for some time now, don't know what to do. I hope I find a solution for it. I called my phone and I found out that I can reach my unlock screen that way. But if I restart I reach those animated circles screen again. Update: This is how I managed to fixed my Nexus 4 phone.